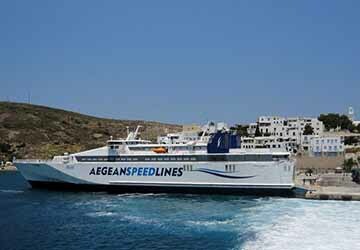 Aegean Speed Lines’ Speedrunner III has been operating between the Greek islands since 2009. 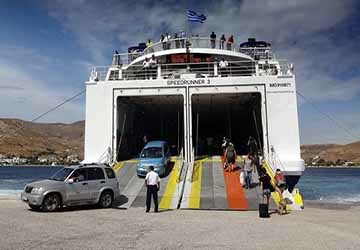 The vessel has a capacity of 809 passengers and 160 vehicles and can reach speeds of up to 38 knots during each journey between the islands of western Cyclades. Different seating options are available with a choice between Economy or Economy with table. 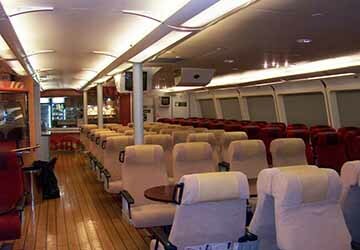 The airline style seating is comfortable, individually numbered and sit within fully air conditioned areas. 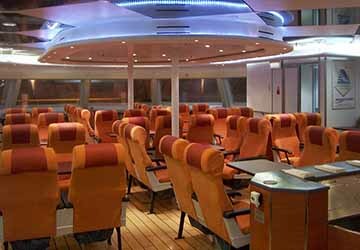 The ship’s café is the ideal spot to grab a light bite to eat and travellers are treated to a variety of drinks options from the on board bars. Voyagers can purchase some last minute souvenirs and necessities from the on board gift shop. You can surf the web whilst you surf the waves with Wi-Fi available for purchase on your journey. Four legged friends are also welcome with special kennels available on deck, free of charge. The Speedrunner is special adapted to cater for travellers with restricted mobility or in need of special assistance. 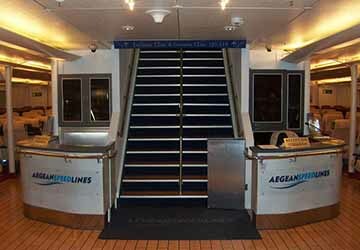 The ferry has an elevator operating between the boarding deck and public areas and disabled toilet facilities are also featured. 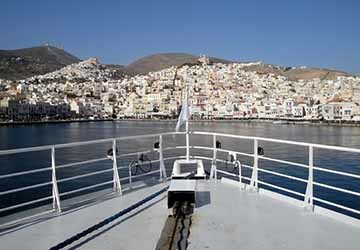 Please Note: Whilst we have taken great care in making our Speedrunner III guide as accurate as possible, onboard facilities, services and entertainment may vary depending on the date and time of year that you travel, facilities mentioned may change without notification and ferry companies reserve the right to operate vessels other than those mentioned at time of booking without prior notification.